Ted will be doing a critique, so bring a tree or two you would like him to look out. He’ll give you some ideas of ways to improve your tree, or answer any question you may have about your bonsai. Everyone who already knows Ted Matson knows that he is one of the best bonsai artists and teachers that you’ll find anywhere. Ted began studying bonsai in 1979 in San Francisco and moved to Los Angeles in 1980, where he became involved in a number of clubs and began a serious pursuit of the art, taking classes from leading masters in Southern California. Although Ted is a lover of shohin bonsai, his collection includes trees of all sizes, styles and a range of species. His trees are known for their proportion and detail. Today, in addition to his own classes, he maintains a busy teaching schedule, traveling throughout the country. He is the curator of the bonsai collection at Huntington Gardens, which is near his home in Pasadena. Furthermore, he is internationally known bonsai master, DBS member and has been teaching bonsai for over twenty years while started doing bonsai over forty years ago. 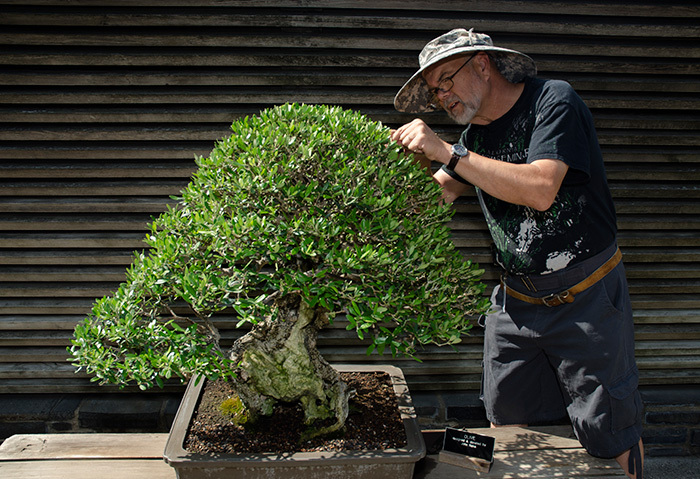 Ted spends days with the 400 plus trees at the Huntington, so he has a great eye for what’s needed or what might help both in the design and health of a bonsai.